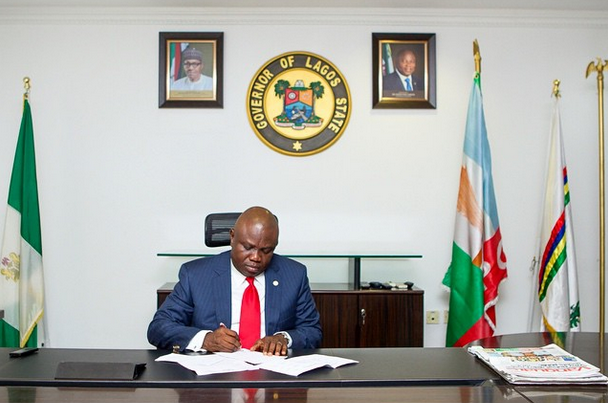 The Governor of Lagos state, Akinwumi Ambode has unveiled a 852.12 billion Naira budget for the 2019 fiscal year. The spending plan which the Lagos Chief Executive presented to lawmakers today, is a massive reduction from the 1.046 Trillion Naira that was passed by the Lagos State House of Assembly, last year. While defending the budget, Governor Ambode explained that “the overall 2018 budget stood at 60 percent and that was put into consideration in preparing the 2019 budget. Lawmakers in Lagos, recently threatened to impeach the Governor, who failed to secure the ticket of the All Progressives Congress to seek a second term in office, over his late submission of the budget. DENISAURUS News understands that a reconciliation move made by Bola Tinubu, a chieftain of the ruling party, might have prevented the impeachment charge against the outgoing Governor.